T-Bone's come to dish it out. Truly BONE-A-FIDE rap with mind-blowing tongue twisting and furious club beats. This album "gots its getting up and sportin bling, trippin the whole way! 15 - Victory! Victory! Victory! 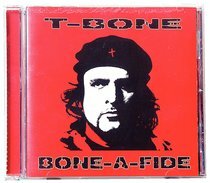 :Hoodlum turned Gospel rapper T-Bone is back with his 7th studio album, entitled Bone-a-fide. Chock full of head noddin', hip shakin' beats and peppered with positive rhymes about faith and life, this 15 track album includes '12 Years Ago', 'Can I Live', 'The Sanction", and more.